Weeks away from Easter, and just at the start of Christians’ Lent season, we followed the news regarding the resignation of Pope Benedict XVI and the group of Cardinal-Electors that were inside the Sistine Chapel appointed to elect his successor, the new Spiritual Leader for the 1.2 billion Roman Catholics around the globe. As masses gathered at St. Peters Square in the Vatican City, on Wednesday March 13, 2013, white smoke rose from a chimney above the Sistine Chapel slightly after 7 pm local time and bells rang out through St. Peter’s Square — traditionally signaling that the church’s Cardinals have chosen a new pope: Argentinian Cardinal Jorge Mario Bergoglio, the former archbishop of Buenos Aires, who takes the name Pope Francis. As technology develops, distances shorten. This has revolutionized the way the world makes decisions and how it works. 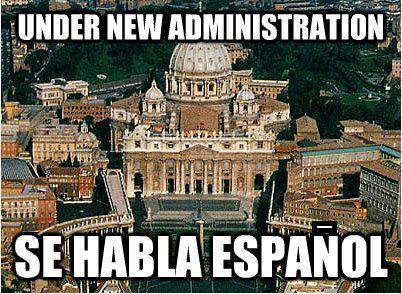 For the first time in history, Pope Francis is the first Pope to come from the Americas, and to come from the Southern Hemisphere. He is conversant in Spanish, Latin, Italian, German, French, and English. 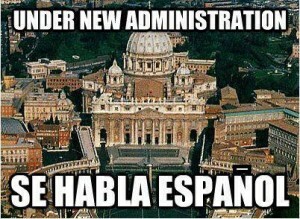 Why should the Pope, the Spiritual Leader of many around the world be fluent in diverse languages? The answer is simple…communication, trust and bonding with people from his flock. This in turn leads to faithful followers and strong Leadership. Pope John Paul II reigned as Pope of the Roman Catholic Church from 1978 until his death in 2005. He was the second-longest serving Pope in history and the first non-Italian since 1523. Throughout his early years, he learned as many as 12 foreign languages, nine of which he used extensively as Pope: his native Polish, as well as Italian, English, Spanish,French, German, Portuguese, Russian, Croatian, Ancient Greek and Latin. He took advantage of his extensive lingual knowledge in order to lead the masses and bond with them. Multiple language acquisition opens new doors to new cultures, their ideas and their people. Learning a new language makes a difference on how you see other people and how the world sees you. Nowadays several international corporations offer multiple languages on their websites. It is but natural to converse, read or listen on your own language. Trusted Translations, Inc. is the place to go for all your multi-lingual needs. We can translate and interpret in over 150 languages. Call us today for all your translation/interpretation needs. Do not miss out on this holy curiosity. We guarantee a blissful experience!